I consistently get asked how to do the turkish get up, so for those who have asked, today is your lucky day! 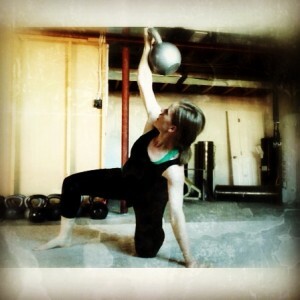 The turkish get up has got to be in the top 5 most awesome kettlebell exercises, but I will caution you, this move is sneakily hard and will show you where your weaknesses are. It is excellent for improving your shoulder stabilization, balance, coordination, whole body stability, posture, and pretty much works all of the major muscle groups as well. The reason I most love the get up is because it works the body in two vital skills: working the upper and lower body together as one unit and getting up off the ground. It requires a high level of skill, so I almost always put them at the beginning of the workout while the body is still fresh. Plus it’ll get the entire body warm and ready for the rest of the workout. *There are 4 positions in the get up: laying down, sitting, kneeling, and standing. At first it can seem like a lot, so the trick is to take it one at a time and just focus on getting to the next position. *Since you are going to be holding a weight directly over your head and face the whole time, start with no weight until you feel comfortable with the movement patterns! Try to make the movement as smooth as possible. *Keep your eyes on the weight, your elbow locked, and your arm pointed at the ceiling at all times. If you can’t keep your elbow locked the whole time, move to lighter bell. This is not a sit up! Use your foot to push yourself over onto your side while at the same time, driving your elbow into the ground and punching your raised hand up toward the ceiling. Make sure you’re using a weight where you can lunge up without bending your arm. From kneeling, curl the toes of your back foot under and, pushing through both feet, lunge up into standing position. If you guys enjoyed this tutorial and want more, let me know over on my Facebook page! But guess what. Most of my clients still really struggled with their eating and, therefore, achieving their health and fitness goals. The thing is that most of us already know what we should be eating. We get bashed over the head with it everywhere we turn these days. This food good, that food bad. Quality, quality, quality. Now before anybody starts throwing a hissy fit, let me clarify: quality is important. I’m absolutely not trying to say that it’s not. HOWEVER, it’s not everything. In fact, in my 10 years of training experience, I have found that focusing on quality alone – or even just elevating it above the other components – tends to cause more harm than good. So let’s talk about why quantity is just as important. First and foremost, the simple fact is that no matter what the quality is, if you eat more food than your body can use, then you will not lose weight. That’s just how the body works. Second, when all three components of nutrition are not taken into equal consideration, we begin to lose a balanced perspective on each of them and misunderstand their relationship to each other and to our nutrition overall. Between our American portion distortion and the common habit of eating mindlessly, quantity tends to go right out the window. When we think quantity doesn’t matter, it leads us to ignore a really integral part of the eating process: the natural hunger & fullness cues that we receive from our body. These things exist so that our body can communicate with our brain about how much food it needs. But if quantity isn’t important then why even pay attention to it, right? When quality is everything it creates an unhealthy relationship with food, even to the point of orthorexia. Orthorexia is an obsession with eating foods that one considers healthy. This is an unhealthy obsession that involves fear or guilt or worry, to the point where it negatively affects one’s quality of life. Nobody eats 100% “high quality food” all the time because nobody eats perfectly all the time. When a food is either “good” or “bad” (“right” or “wrong”), it leaves no room for a healthy balance. There’s no room left for a guilt-free thought or action like: “I like this food, so I’m going to enjoy it” and then simply moving on with life. What usually results is other disordered eating habits like feeling out of control around certain foods or binging. What’s most interesting is that even with the heavy emphasis on quality in our culture, we still have a huge problem with weight and eating disorders. When quality is the only focus, the other two deteriorate and usually end up bringing food quality down with them. This often leads to years, if not a lifetime, of struggle with food and eating habits. Yet, so many are very afraid or even hostile to the idea of taking a step back from quality to focus on something else for a time. I get it. I was too for a long time. But eventually, I had to start looking at the situation honestly and be willing to step outside the box and try something different. Because what we’re doing right now is not working. **Know that quality isn’t everything and it’s OK to not focus on it all of the time. Look, you don’t need me to tell you that if all you eat are donuts, your body’s not gonna like that and it’ll let you know so. What I do need to tell you is this: You won’t blow up like a whale or instantly get heart disease from eating a donut every once in a while. Healthy eating, just like every other aspect of health, should enhance your life. Don’t let it become a burden instead. 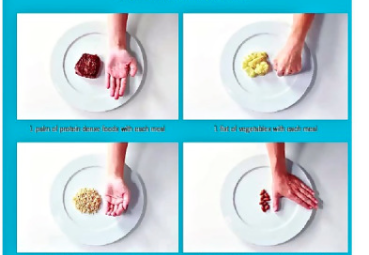 I do not believe you need to measure and weigh and count every little thing that goes into your mouth, but it’s good to be aware of what a proper portion size is. Most of us tend to have a slightly skewed perspective because…. I know I sound like a broken record on this one, but that’s because the benefits of this practice are so very worth it. 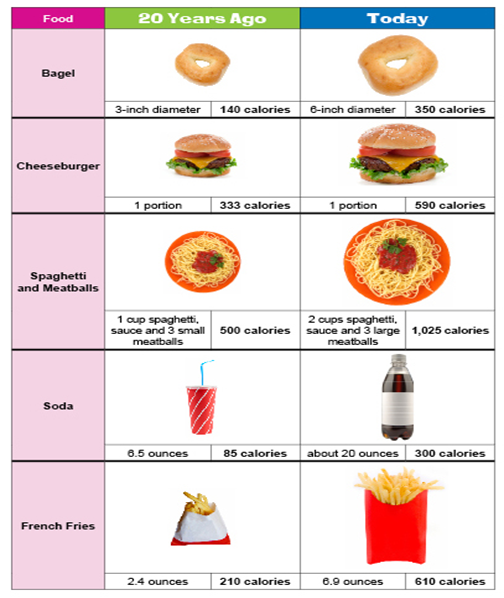 Here’s the thing about the calories in, calories out idea: our body handles different foods differently and it’s needs change often and without warning. Try eating only when you’re hungry and you will find that there are days where you can seriously throw down and other days where you need very little. The coolest part about it is that, with some practice, you can actually figure out a lot about what and how much your body needs without any outside help. When those needs change, you will feel it. If you’re eating too much, you won’t be hungry for your next meal. If you’re eating too little, you’ll get hungry too soon. If you’re not getting the right amount of fiber, you’ll have cramps or gas. If you’re feeling tired in your workouts, then you might need to up your protein intake… or your sleep. Yep, those last two have to do with quantity and quality. See, I’m not against quality. 😉 To improve overall health and body composition, you will eventually have to look at that aspect. I have just found that the other two not only need to be addressed, as well, but are often a much better place to start when trying to improve health through nutrition.